In the 1780s revolution was in the air - the American Revolutionary War ended in 1783, and the French Revolution broke out in 1789. In Sutton Coldfield, the townsfolk were dissatisfied with their governing body, the Warden and Society, finding its attitude patronising and its exclusivity irritating - as Riland Bedford diplomatically put it, “the position of the corporation had been for some time precarious as far as their popularity went”. In 1788 some of the townsmen, rather than start a revolution, began proceedings against the Warden and Society in the Court of Chancery. The Court issued an injunction in 1792 which severely limited the corporation’s freedom of action, and later decreed that the injunction would stay in force until a satisfactory scheme for the use of the town’s resources could be agreed between the Court, the objectors, and the Corporation. Such a scheme was proposed in 1808, the main item being the provision of elementary education for all children. It was proposed to build two schools, one in Sutton and one at Mere Green, and to appoint “proper persons to instruct Poor children under the age of seven who live in the Parish” but who lived too far from the schools to attend. This was not acceptable, and a second scheme of 1817 was put forward, again for the schools at Sutton and Mere Green, each for a hundred children, but also a preparatory school for forty children would be erected Beyond the Wood for those children who lived at too great a distance from the alternative schools - most of such children lived in the sparsely populated south-eastern district of Sutton known as Walmley and Beyond the Wood. The Warden and Society were confident that the 1817 scheme would eventually be adopted, and began to plan accordingly, and a sub-committee was appointed to consider practicalities. There was some confusion over the best site for the Walmley school - the committee met on December 11th 1822 resolved that “a portion of the Corporation property at Walmley now occupied by Henry Brookhouse” was suitable, but a week later they recommended land at Thimble End owned by Mr. Joseph Webster of Penns Mill. Either of these sites would have been able to serve the scattered population - Walmley village then consisted of several houses in Walmley Ash Lane, further south-east lay Minworth Greaves with a few cottages, then there were the settlements of Wigginshill, Over Green and Bumble end along the Sutton boundary. There was a scattering of cottages in the Langley area, over the other side of commons was the flourishing Penns Mill with its workers’ cottages, and there were a few cottages down Eachelhurst Road. However, the Thimble End site was chosen, perhaps because Henry Brookhouse was reluctant to give up any land (he only had fourteen acres), while Joseph Webster was happy to give up his one-and-a-half acre site, and Joseph Webster was a member of the sub-committee. The scheme was finally approved by the Court of Chancery in 1824, and until the school was in being (it opened in 1827), Mrs Short was engaged to teach ten boys and ten girls in her house at Thimble End (Fox Hollies Road). In 1826 Mr. Holbeche was authorised to build the school at “Beyond the Wood”, and in 1827 Sarah Ann Adams was appointed teacher at the newly built school. The old Walmley school was eventually superseded by one in Walmley Road, and the school house was converted into a dwelling house. It fell prey to a property developer in 2004, and two houses now stand on the site of what was once Walmley’s most historic building. Walmley and Beyond the Wood Quarter - the base map is Greenwood’s 1822 map of Warwickshire. 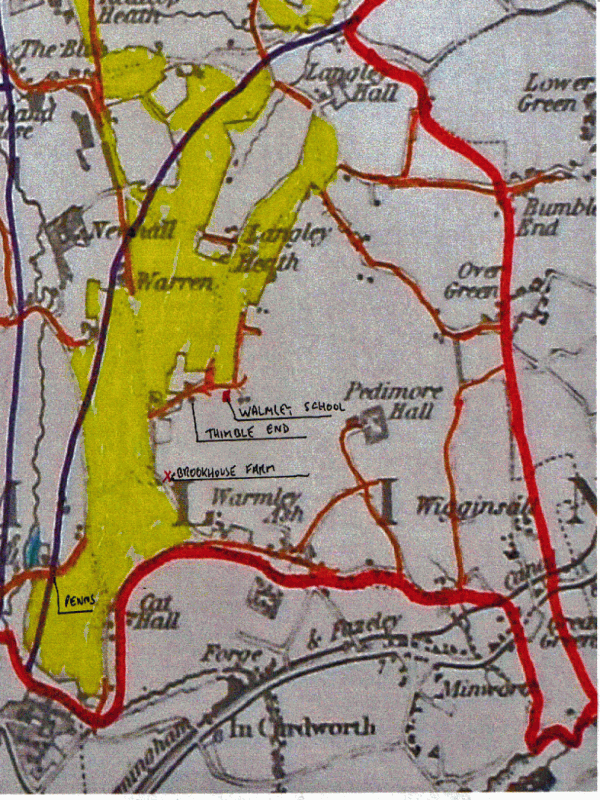 The yellow area, later occupied by Walmley Village, was then open common; houses are shown on the map as black dots. Henry Brookhouse’s farm is near the top of the large letter L (the whole word is Hemlingford, this part of Warwickshire lying in Hemlingford Hundred).